It would be so fun! But it’s expensive. We can meet new neighbors! But Bradley might not even care about it. Hey, I would have fun! Be practical: there is a free baby pool in the backyard. We’re not even taking a vacation this summer, can’t this be the vacation? 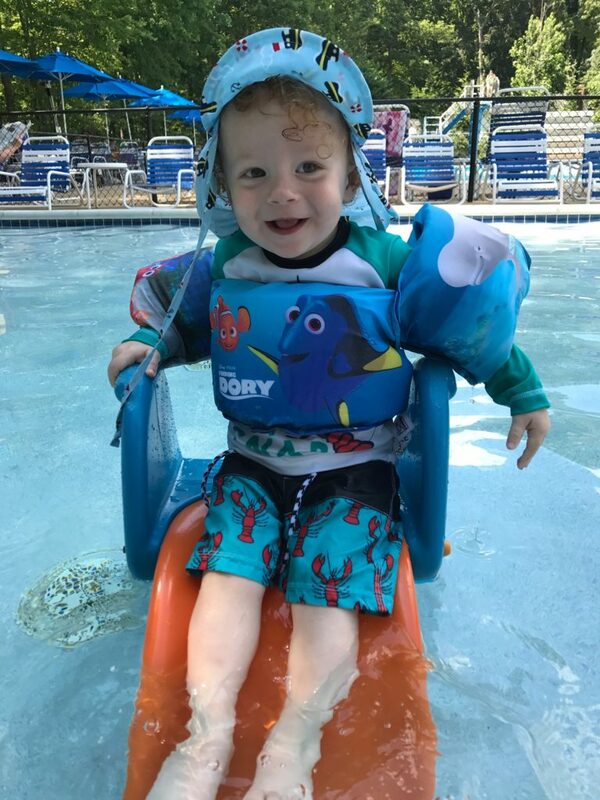 Ultimately, I decided that as a pregnant mama to a very active toddler, I really wanted to have pool access. For myself. Not even going to pretend like it’s something the kid needs, this was purely selfish. Sometimes a girl needs some buoyancy. 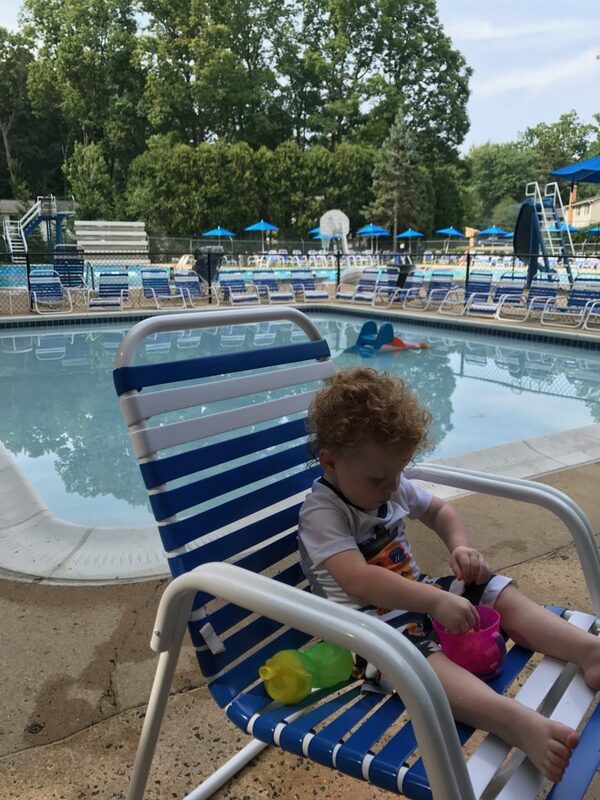 There are three great pools in our immediate neighborhood, plus more within a short driving distance, not to mention a rec center with an indoor pool nearby. 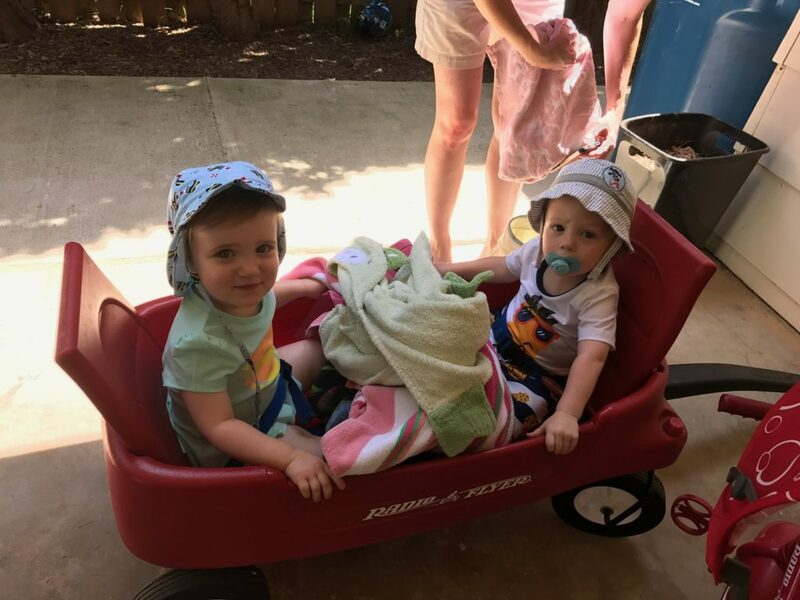 And once we had our first 80+ degree day and I was worn out from chasing our son up and down our street (we live on a hill), I caved. I picked our pool almost solely based on the size/location of its baby pool. It is always shaded and is literally the size of our living room! We go to the pool about 5 afternoons a week. Bradley gets so excited when we tell him we’re going to the pool. “Pooooooool!” he will squeal as he tugs at his puddle jumper. 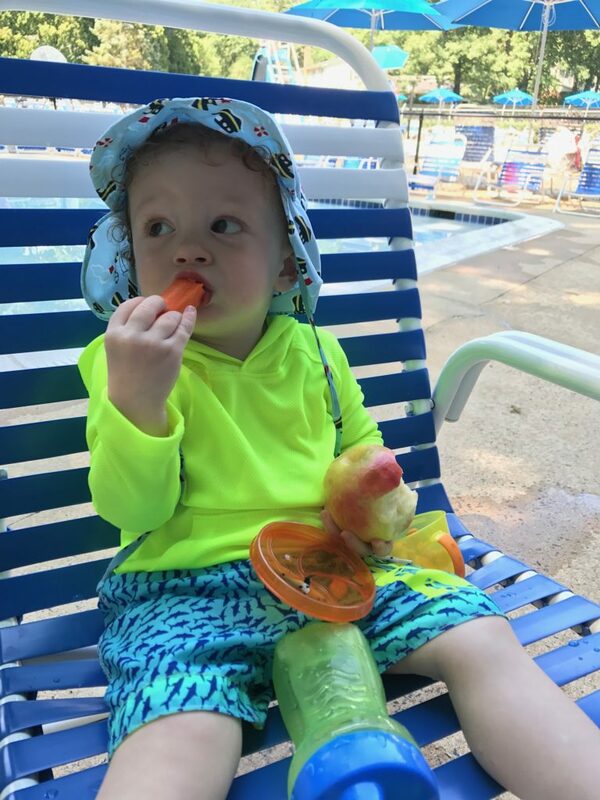 Of course, our schedule usually consists of playing in the water for about 15 minutes, then having a snack (a “heck” if you speak Bradley) for 15. He loves meeting new friends here and giving hugs to the neighbors he remembers. It is really sweet. Also, watching him in a contained area is soooo much easier than chasing him, a Radio Flyer scooter, and a rogue bouncy ball up and down our street in this July heat. I had no idea how much of a suburban social establishment these pools are. One of my students told me that when she moved here, the first question everyone asks at school is “What pool do you go to?” And it’s not just the kids! Apparently the adult parties are crazy hoppin’ events that go until the wee hours of the morning. There are all kinds of food trucks, themed nights, and meet-ups happening all summer long. I don’t really know about these things, though. 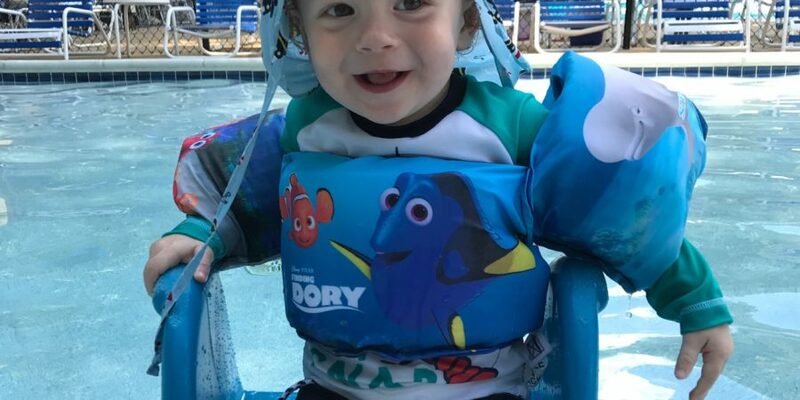 Right now we’re just there for the sweet baby pool. Figuring out an organizational/logistical system for going the pool has taken some time. I have only actually walked to the pool once. It wasn’t easy. 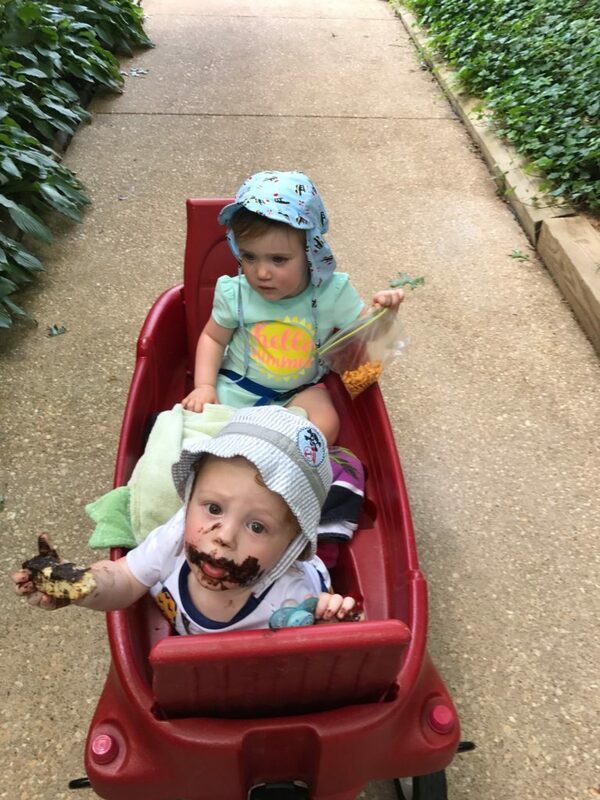 My cousin was visiting with her baby, so we put them both in the wagon and loaded everyone down. The temperature was in the 90s that day, and the walk is mostly in the sun. We were loaded down with bags and the babies got fussy. I gave Bradley the first snack I came across, which was biscotti. So that took a few minutes to clean up. 😂 I was so worn out from that trip that I decided to not walk again. When this kid is old enough to bike, we can do that. Or maybe I would feel differently if I weren’t getting so pregnant. 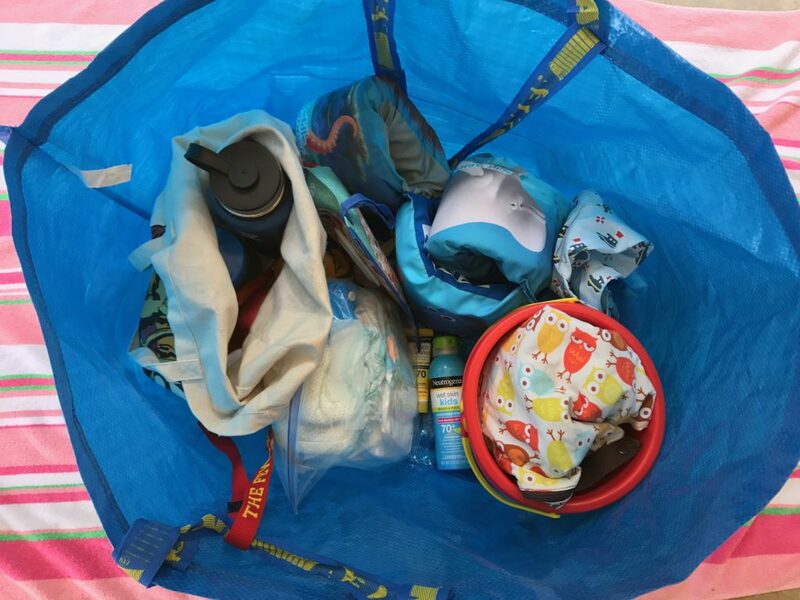 There are a lot of things a parent has to take to the pool, even if you only have one kid! 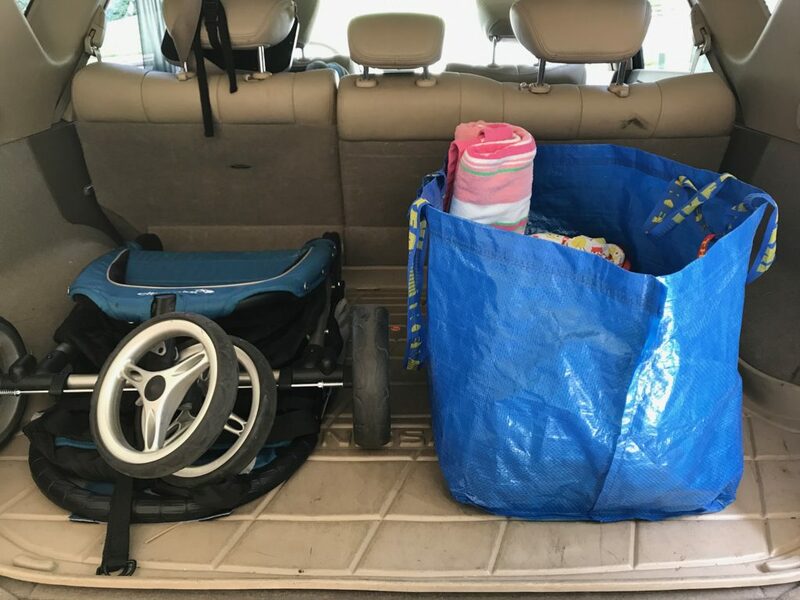 There are swim diapers and wipes, a puddle jumper or swimmies, sunscreen, snacks, water bottles, towels, toys, plus the personal items like pool passes/money/phones. The pool bag I used must have come from band camp in 1999. It is clearly meant for one person, and not a mom. Clipping the puddle jumper and wet bag (containing toys) to the straps made it work, but I felt like the awkward bag lady. I started polling my Facebook mom groups to see what more experienced pool-going folks used. The least expensive route, it turns out, is the 99 cent Ikea blue bag. I would have never thought to use one of those! It is large enough to hold everything (including towels! I just started forgoing a towel for myself because they’re too big), is durable and hardy, and fits easily into the back of the car. 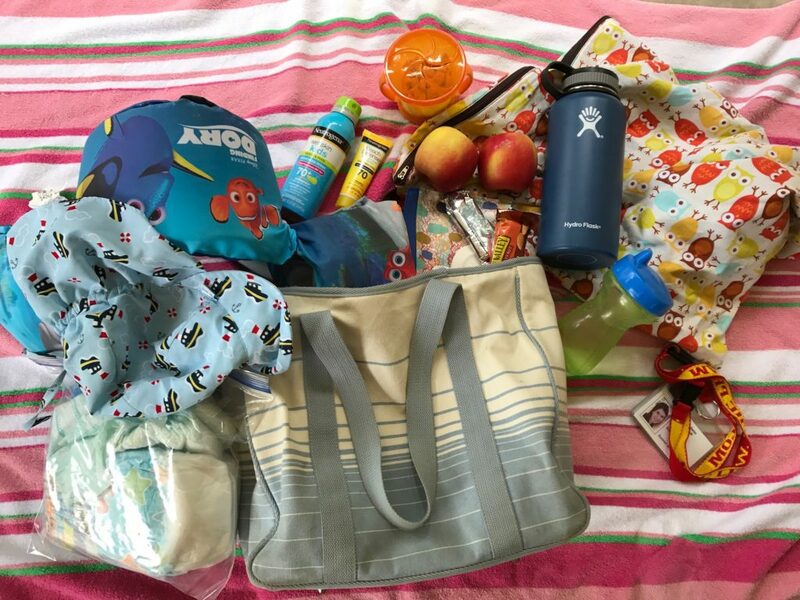 It doesn’t have individual pockets, so I’ve been using other small bags to contain categories (like the “snack bag,” the Ziploc bag holding diapers, and the bucket for toys). The other common recommendations from my online mom friends were a canvas Lands End extra-large tote ($46 + embroidery) or a 31 Deluxe Utility Tote ($50 + embroidery) with awesome side pockets. Things to consider for next year (when I’ll be hauling a toddler AND a baby 😳). What do you use?